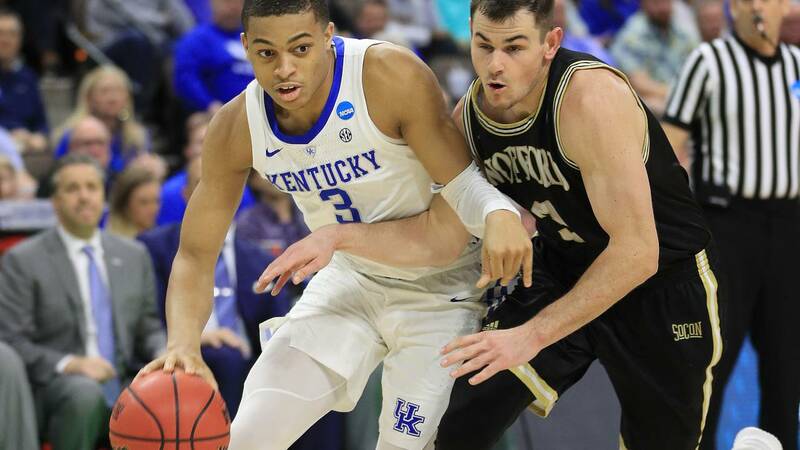 Second-seeded Kentucky moved past the Wofford Terriers 62-56 to advance to the Sweet 16 in the NCAA Tournament Saturday. The Kentucky Wildcats, who blew out No. 15 Abilene Christian 79-44 in the first round on Thursday, are now 29-6. Reid Travis led the Wildcats with 14 points and Nate Hoover led Wofford with 19 points. The Terriers (30-5) opened up their Midwest Region play on Thursday with an 84-68 win over No. 10 Seton Hall. That first-round victory saw senior guard Fletcher Magee set the Division I career record for 3-pointers, hitting seven treys on the way to 24 points to lead Wofford to their first tournament victory in five tries. The 20 straight victories leading up to the start of the NCAA Tournament saw them go unbeaten in the Southern Conference's regular season and then sweep through the conference tournament.